Attempts to define postmodern cinema. Marking the beginning of a historical period with political, cultural, aesthetic, scientific, and moral experiences which are distinctly different from those of an earlier phase of history commonly called modern or Enlightenment, postmodernism is associated with the historical transformations that followed World War II and with the cultural logics of late capitalism. Together they brought about significant changes in human sensibility and subjectivity and aesthetically led to the emergence of a new artistic style. This essay will discuss to what extent the postmodern style is characterised by pastiche/parody and a nostalgia for the past by referring to Woody Allen’s mock documentary Zelig (1983) and the controversial film Blue Velvet (1986) by David Lynch. There are many critical positions and views taken in relation to postmodernism. Ihab Hassan points out that the term can be interpreted as an oxymoron with a short history: if the modern represents the present or the recent moment, how can something be post, or after the modern? (1985:121). From this perspective, postmodernism could even be viewed as a continuation of modernism (Updike 1984 quoted in Denzin 1991:2) and indeed some critics simply deny its separate existence.First used by Federico de Onis in the 1930s to indicate “a minor reaction to modernism” (Featherstone 1990:7), in 1947 by Toynbee to designate a new cycle in western civilization and in 1959 by C. W. Mills (1959:166) to describe the Fourth Epoch in world history, the term became popular on New York’s artistic scene in 1960s and used to refer to a movement beyond the “exhausted” high modernism (Featherstone 1990:7). In the 1970s and 1980s the term gained wider usage in architecture, the visual and performing arts and music and came to be associated with the following traits: the erasure of all kinds of boundaries and distinctions (between art and everyday life, between “high art” and mass/popular culture, between past, present and future); a specific style defined by eclecticism, reflexivity, self-referentiality, quotation, artifice, randomness, anarchy, fragmentation, playfulness and the mixing of codes which results in parody, pastiche, irony, allegory (Sarup 1993:132); a consumer culture that celebrates the surface and “depthlessness” of culture; a shift of emphasis from content to form or style; but also a nostalgic, conservative longing for the past; an intense preoccupation with the real and its representations; intense emotional experiences shaped by anxiety, alienation, resentment and a detachment from others (Denzin 1991:vii) etc. Thus, postmodernism can be viewed to contain many contrasting and contradictory tendencies and it can be argued that what best distinguishes postmodernism from the preceding periods is, as Jim Collins pertinently remarks, the artistic cohabitation of competing styles: “”Post-Modernism departs from its predecessors in that as a textual practice it actually incorporates the heterogeneity of those conflicting styles, rather than asserting itself as the newest radical alternative” (1989:114-115). However, a specific, distinctive postmodernist style may be identifiable. Frederic Jameson, for instance, argues that postmodernism is, above all, a culture of pastiche, a culture that is marked by the “complacent play of historical allusion” (1988:105). He makes the distinction between pastiche and parody, both practices of imitation and mimicry: whereas parody has a purpose – to mock, ridicule, satirize and has polemical, critical and comic potential, pastiche is a “blank parody” (1991:17), a mere imitation that apparently does not do anything. The critic condemns the world of pastiche as “a world in which stylistic innovation is no longer possible: all that is left is to imitate dead styles, to speak through the masks and with the voices of the styles in the imaginary museum” (Jameson 1985:115). 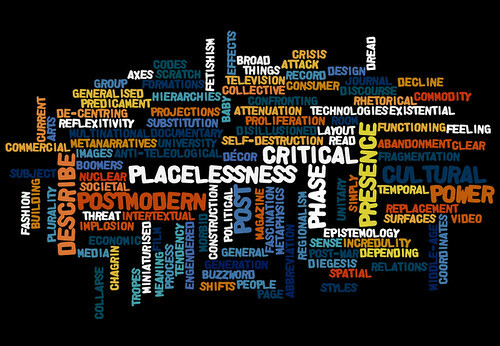 According to him, postmodern culture is a culture of quotation as opposed to a culture of creativity, in other words, “a culture of flatness, of depthlessness, a new kind of superficiality” (1984:60). This is a strong critical viewpoint that could be polemically contrasted with the arguments put forward by Richard Dyer whose book, Pastiche (2007), is the first full study of the term and its usage. In Dyer’s in-depth study, pastiche is defined as a compilation of disparate elements with two remarkable aesthetic merits: richness and vitality. These qualities derive from the clash of styles, the subversion of dominant white cultures, the breaking of the boundaries of medium and genre. Thus pastiche is regarded as liberating, challenging, revolutionary, politically progressive, multivocal (Dyer 2007:20-21). Similarly, Ingeborg Hoesterey argues that postmodern works based on pastiche have “emancipatory potential” (2001:29) for their “dialectical stance toward history” (ibid. 25) or for the way they rework “cultural codifications that for centuries marginalized unconventional identities” (ibid. 29). To this effect, Woody Allen’s film Zelig, a pastiche of a black and white documentary from the Thirties, is a work of outstanding creativity and remarkable technical virtuosity (Bendazzi 1984:173).This false biographical documentary is a mix of genuine archive film material as well as scenes shot specifically in the style of a 1930s traditional documentary using grainy silent film and stills. Starting in the 1920s, the film goes through the sound era and ends in color in the 1980s, thus also mapping the history and evolution of cinema. Making clever usage of library footage and newsreels, the whole film is passed off as authentic in such a way that a completely fictitious and implausible story is presented as a testimony to an epoch. By means of truly expert trick photography, Woody Allen and Mia Farrow hug Josephine Baker or James Cagney. The lighting is done in the style of the period and there are “rain-type” streaks to give the effect of worn film. The sound is metallic, imitating the echo that characterizes early film and the tone and words of the spoken comments seem to have come from the archives as well. The brand new songs written for the film (“Leonard the Lizard”, “Doin’ the Chameleon”) are pastiche musical numbers totally in keeping with the style of the Jazz Era. Thus Allen recaptures an entire world, its atmosphere, tastes, customs, ideology and stylistic peculiarities being reproduced with precision and love. 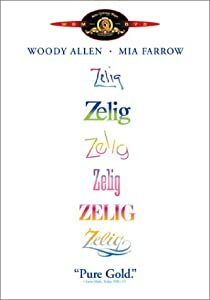 Being based on pastiche, Zelig is what Jameson calls a “nostalgia film”, a film that reinvents “the feel and shape of characteristic art objects of an older period ”(1985:116) and evokes a sense of the narrative certainties of the past. Jameson is however very critical of the nostalgia film arguing that it effaces history, being a film about other films, a representation of other representations through its “random cannibalization of all the styles of the past” (Ibid.:65). Also, in his view, nostalgia films do not attempt to recapture the “real” past but are structured around certain cultural myths and stereotypes about the past, offering an image of “false realism”. A second stylistic feature of the nostalgia film is thus “cultural schizophrenia”, a term borrowed from Lacan and used to signify a language disorder and the failure of a temporal relationship between signifiers i.e. the experience of time not as a continuum but as a perpetual present. To exemplify, in Zelig there is a scene of Adolf Hitler making a speech with the figure of Leonard Zelig lurking in the background. Created by parodic juxtaposition of superimposing newly staged material into borrowed material, a sense of incongruity emerges from this historically impossible juxtaposition. Thus, through the absurd neighboring of a contemporary actor with long-decreased public figures, Zelig displays a sort of “freedom from historical limits” (Stam 1989:198) that is characteristic of the postmodern effacement of boundaries between past and present. Although this can be equally related to a sense of postmodernist playfulness (a play of signifiers), to the fact that in postmodernism the work of art (a modern concept) is replaced by the “text” which can be “read”, deconstructed and reassembled according to other criteria, Jameson argues in a very serious vein that such a culturally schizophrenic product (e.g. the nostalgia film) has lost its sense of history and its sense of a future different from the present, being locked into the discontinuous flow of perpetual presents and suffering at the same time from “historical amnesia”. This concept will be explored further in the discussion of Blue Velvet which is even more representative of the nostalgia film, being set in the late 1950s which for Americans represent “the privileged lost object of desire” (Jameson 1984: 67). Returning to the notions of pastiche and parody as being representative of the postmodernist style, Zelig can also be considered a parody of the traditional documentary genre, with the ulterior purpose, it can be speculated, of ridiculing the unreliability of contemporary media, the capricious nature of social opinion, the status of celebrities, the tendency to conform, etc. However the extent to which Zelig is a parody as opposed to an “innocent” pastiche is a matter of interpretation. Denby for instance sees the film as “a loving parody of the “serious” style of historical film investigation, complete with stock footage, archive stills, period music, newsreels, and interviews with savants…” (1983:51).Considering that parody is always polemical, critical, satirical and involves a distancing effect from the parodied source, “loving parody” strikes one as an oxymoron. However, the confusion over pastiche/parody can be solved by arguing that the film contains both devices: its form is a pastiche (pure imitation without the intent to mock that which it imitates) whereas the content is parodic, hence its great comic potential: a journalist’s candid admission that the media usually deforms and plays with the truth in order to sell newspapers, Zelig’s confession under hypnosis of a rabbi’s attempt to charge him a fortune for Hebrew lessons (here Allen is fulfilling audience expectations by playing with ethnic stereotypes), the allusion to Fascism and its functioning as an escape into anonymity which could help Zelig “to make something anonymous of himself” etc. Among its other techniques of achieving humor, irony and parody, the film makes use of “celebrity intertextuality” defined as “a filmic situation where the presence of a film or television star or celebrity intellectual evokes a genre or cultural milieu …” (Stam et al. 1992:207). Thus, real contemporary cultural heroes such as Susan Sontag, Saul Bellow, Irving Howe, Bruno Bettelheim are interviewed and offer their interpretations of the “Zelig phenomenon”. The humor evoked with this type of intertextuality arises from audiences being familiar with their extra-textual performances and the witnessing of their juxtaposition in the pseudo-documentary. Also the fact that they are famous people playing themselves adds an element of similarity and validity to the parody. Thus the film’s discourse teeters between fictional construction and documentary validity by identifying subjects who have an extra-textual existence but are actively discussing fictional subjects without a blink, with ironic incongruity as a result. Thus it can be argued that far from being simple mimicry that is parasitic of its object and that “does not create anything” (Dane 1988:5) parody and pastiche are complex devices that can actually create new textual configurations and modifications to pre-existing canons. They also foster new “ways” to view texts, developing critical spectatorial strategies (Harries 2000:7). Linda Hutcheon (1985: 94) posits that the reading of any ironic discourse requires a triple competence: linguistic (the reader has to comprehend what is said but also what is implied), generic (comprehension of what “logonomic system” is being parodied), ideological (awareness that norm violation is occurring and its implications). For instance, Susan Sontag’s interview delivers lines that not only parody typical “expert” responses found in historical compilation documentaries but also parody her own style of critical assessment: “He was the phenomenon of the 1920s. We think that, at that time, he was as well known as Lindbergh –it’s really quite astonishing”. The subtlety of the ironic discourse calls for great familiarity with the target texts and serves to make Zelig “a comedy for the cognoscenti” (Sarris 1983:39 quoted in Harries 2000:109). Another film that displays pastiche, parody and a nostalgia for the past is Blue Velvet. Aesthetically within the classic film tradition of the 1940, the film is based on the appropriation of film noir conventions and intertextuality, recycling images from the past and reassembling them in the form of bricolage/pastiche: the ideas of small town innocence allude to Hitchcock’s Shadow of a Doubt, the opening heart-attack sequence is reminiscent of the Lumiere brothers L’Arroseur Arrose (1896) and the Badalamenti score seems derivative of the music in Experiment in Terror (Blake Edwards, 1962). The purpose of utilizing these prefabricated images is to either subvert them in parody or to simply quote them in pastiche, which can also be a way of paying homage to the source material. In Blue Velvet the presentation of grotesque amidst the normalcy of everyday life, the juxtaposition of sacred and profane, light and dark, innocence and criminality might work in the service of unmasking, of satire, of subversion, or they might not. Lyotard for instance sees the film as waging a war on nostalgia due to the fact that it locates terror in the past whose signifiers can work as signs of destruction (1984:81). Thus, critical opinion is divided between those who read the film as a mock-nostalgia parody and an ironic, subversive comment on the values and hypocrisy of small town America in the 1950s, and those who read the film’s evocation of innocence as sincere which would make it a genuine nostalgia film “with a difference” i.e. the dark subtext to a Frank Capra film. According to this, Lynch can be viewed as either a great subversive satirist or as a sentimentalist and reactionary. Lynch’s own interpretation of the film is that it is not a critique or subversion but a contrasting view of contemporary America with its innocent, naïve side as well as its horror and sickness (Lynch in Rodley 1997:139). This is in line with Denzin’s view of postmodern film that tries to echo and reproduce the tensions and contradictions that define our time (1991: 177). The problem with a reading of Blue Velvet as either in league with, or ironically distanced from the forms of nostalgia it invokes, implies that, by today’s standards, irony or the lack of it has become a measure of a film’s level of critique. This propensity towards an ironised reading may be a product of what Wallace calls “the ironic tone of television” (1992:62), a medium whose rapid-fire editing and juxtaposition of “real” (news) and simulated, high and low unwittingly deconstructed the traditional Hollywood genres by making their skeletal formulas visible as narrative products, leading to the emergence of an ironised audience in the 1950s and 1960s. An alternative reading of Blue Velvet could see it as neither entirely ironic and parodic, nor entirely serious and “nostalgic”. This reading is supported stylistically as the film operates two very different stylistic registers and runs a double standard throughout. For instance, the opening sequence is surreal and clearly parodic, which immediately frames the film as postmodern: the slow-motion rhythmic waving of the fireman, the children orderly crossing the street, the scenes are colourful and brightly lit, even the father’s heart attack is treated in a comic register. Similarly the closing sequence parodies many cinematic standards, being the conventional closure of classical narrative: order is restored, the return of the father re-establishes a patriarchal hierarchy, Dorothy is “cured” of her sadomasochism and reunited with her child, the heterosexual couple of Sandy and Jeffrey is constructed (this subversion of cinematic form betrays a questioning of meta-narratives which is another characteristic of post-modernism). However there is a sharp contrast between the opening and closing sequences and the middle of the film, the dark world of criminality where the main events happen at night in gloomy settings. This is filmed in a “realistic register “and the violence itself is real, shocking and dangerous. As Laura Mulvey suggests, “the film excavates a topography of the fantastic, of an underworld, out of a social setting which appears to repress its very possibility”(1996:152). Thus, the juxtaposition of the two worlds has a confounding effect on the viewer. A very easy explanation is to interpret the middle of the film as Jeffrey’s dream or his fantasy (boy saves girl) that starts with the long shot that slowly zooms into the cut-off ear and ends with a similar zooming shot out of an ear that turns out to belong to Jeffrey when he awakens on a sun lounger in his garden. This is similar to the Wizard of Oz narrative structure, in which the Oz story is a dream experienced by the protagonist Dorothy. However, the contrast between the surrealism of the opening and closing and the grim realism of the fantasy suggests that Jeffrey’s reality is more “unreal” than his dream. Thus the mechanical robin in Jeffrey’s garden reminds us that it is a film we are watching, which is a simulacrum a reality, hence hyper-real, and hyper-reality is according to Baudrillard another characteristic of the postmodernist style (1984). Considering that the film seems to elude the sincerity/irony binary reading paradigm that holds sway in postmodernism, Rombes suggests that Blue Velvet and Lynch’s films in general pillage old styles and genres not to demystify old forms but to build unstable narratives. This can be seen as a move beyond postmodernism’s ironic, parodic appropriation of historical genres and narrative conventions. Thus Lynch seems to create an alternative sensibility through his “aesthetics of juxtaposition” (Rombes in Sheen & Davidson eds. 2004:61-75). For instance, the pastiche in Blue Velvet is achieved by juxtaposing and mixing a traditional Hollywood narrative with the experimentalism of an avant-garde cinematic form. This disparity between avant-garde and classical modes derives from the fact that Lynch explores American myths in a cinematic language that has a history, which is what makes intertextuality (as expressed in pastiche and nostalgia) unavoidable and not a simple imitation and recycling of retro styles. As illustrated with examples from Zelig and Blue Velvet, the postmodern aesthetic relies heavily on four tightly inter-related concepts: parody and pastiche, prefabrication and intertextuality, all imbued with a genuine or ironic nostalgia for the past. Whereas modernism was about production and consumption, postmodernism emphasizes reproduction and re-consumption, the main implication being that art has become mere repetition and imitation, that the author is dead. However this essay tried to demonstrate that far from being reduced to a mere recombination of various stereotypes from the past, as Jameson seems to suggest, postmodern film is a sophisticated and complex act of taking stock of the cultural heritage of the past and filtering it through new criteria, creating new configurations of meaning which make the audience more critical of the cultural products of the past (as seen with parody). Thus the certainties of the metanarratives of the modern era are replaced with ambiguous and uncertain narratives that betray a sense of the fragmentary and the inability to distinguish between the “real” and the artifice, as well as a blurring of high and low cultural boundaries, as Lyotard suggested. The modern sense of unified, centred self is replaced with a decentred self and multiple, conflicting identities, the source of this transformation being also based on the uncertain social realities that followed World War II: the Cold War, the Vietnam War. In America for instance, the Pentagon Papers scandal, Watergate demythologized and destabilized old narratives of American exceptionalism and nationalism with the result that a new logic emerges – the postmodern logic, which is based on rhetorical shifts and jump-cuts between sincerity and irony that are mixed with a confounding effect. Postmodernism seems thus to be mimetic of the social realities of its time, as art is in general, and it cannot be accused of lacking creativity and being parasitic of the old forms of the past, as the use of pastiche, parody and nostalgia films appear to imply. On the contrary, as pointed out in the case of pastiche, these stylistic and rhetorical devices have clear aesthetic merits such as richness and vitality, and stem from a sense of postmodern playfulness that leads to artistic hybridity and a violation of generic boundaries, postmodernism being a recombinant culture par excellence.